In this page 10th grade geometry solution4 we are going to see solutions of some practice questions. 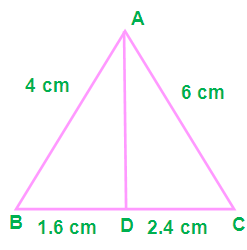 (9) In a triangle ABC,AD is the internal bisector of angle A, meeting BC at D.
(i) If BD = 2 cm, AB = 5 cm, DC =3 cm find AC. 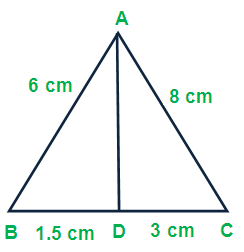 (ii) If AB = 5.6 cm, AC = 6 cm and DC = 3 cm find BC. 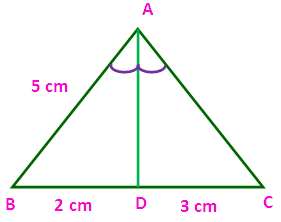 (10) Check whether AD is the bisector of angle A of the triangle ABC in each of the following. 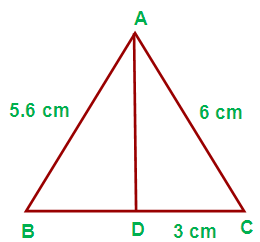 From this we come to know that AD is the bisector of angle A of the triangle ABC. 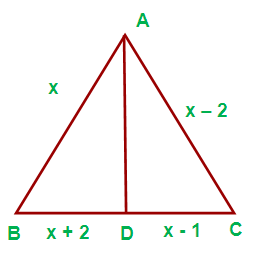 From this we come to know that AD is not the bisector of angle A of the triangle ABC.